Most kids my age wouldn't even blink at the mention of it. To them, the word "Google" means no more than that website that they get Fortnite V-Bucks generators and silly games to distract them in class from. Or, even worse, Google Classroom and hours of homework may have caused them to form a negative association with the term in their minds. But for me, my favorite tech company in the whole world (sorry Apple and Microsoft) brings up a variety of other things in my mind: YouTube, fun, Google Doodles, innovation, Blogger, and... Google+, their one unappreciated child. So unappreciated, so unpopular that almost no one wanted to use it. That literally, according to Google themselves, 90% of user sessions were less than five seconds long(!). 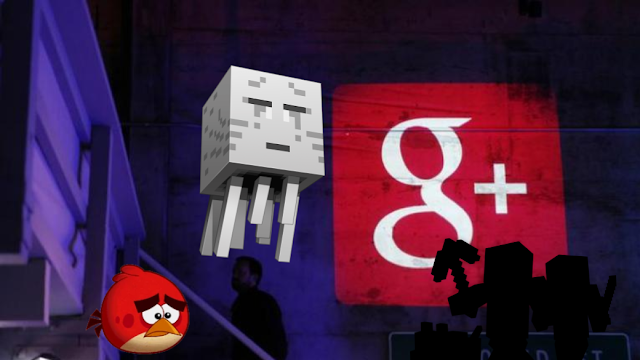 Goodbye, Google+. It was good knowing you. For years, you were the only form of social media I ever knew. I started out using it for the sole purpose of trying to download Minecraft Pocket Edition betas in 2014. It didn't matter if (at the time) it was only available on Android and all I had was an iPad. It didn't matter if my posts barely gained any traction. I felt a part of something, part of a larger community, where I could make friends, share ideas, and foster entire online communities with my close friends. I remember the "moderator wars"-- so called, since they were virtual elections with my close friends (most of whom no longer have Google+ accounts) to decide whom would moderate our modest "Randomness" communities. Just thinking about it brings nostalgia to my heart, of a time that was much simpler and less complicated. Where all it took to get connected to fellow Minecraft, Star Wars, Angry Birds, meme (the list goes on an on) fanatics was a single website. Goodbye, Google Plus. Most of the world knows you as a mediocre social media site that failed to gain much momentum. But you are better than all the Facebook, Twitter, and Insta-whatever in the world. "Snapgram and Instachat" didn't let you sign up with just a Google account, did they? And at the time, they didn't have as many of my friend group of peers in them. Back then, Google+ was the way to go for me. But oh, now things have changed. The dark clouds of desperation, clouding Google's corporate minds, have decided that keeping you wasn't worth it to them. That they should disown their least popular child. But you were still beloved in my mind, at least. Your siblings, YouTube and Blogger will still stick with me, but all being of the same mother, it will still be a permanent reminder of your loss. Well, thanks for everything. For all the blog views that I got by advertising at the fan base communities. Unlike a place like Reddit or Twitter, this attempt to let my hard work be known by others wouldn't be frowned upon or banned. Thanks for that time that I stayed up late, trying to control my lead in the Moderator election of Spring 2016, at that AABO sleepover I had after watching the Angry Birds movie (Burak and Ali, you guys know the one). Thank you for the silly Minecraft posts, for the cringy memes, for the feeling that I was part of something with people just as obsessed as I was. Thanks for the 112 followers (yeesh, that seems more than my profile deserved), even though I technically don't care about the "numbers", as any reader of my blog would know. Thanks for defining much of my late childhood. I'll never forget you for that. Even now that I actually have my own cell phone (at last), and am of the age to be able to use most social media, I really doubt I ever will, for the time at least. Let's have a moment of silence for you, sweet Google Plus prince. You were were something special, extra. I guess you could say that you were even a "plus" above the rest. End Game may come and go, but you won't be saved from the Thanos Googler's wrath. Now I constantly am hearing "Sweden C418" in my head on loop, since it sounds sad and makes me nostalgic. Amen. Oh, and I know this post is getting long, but one more thing. After seeing the mass chaos of the Google+ homepage in the last few hours before the site's death (people posting things that don't even belong in certain communities, frantically crying and saying goodbye, each person writing a deep tribute)... Honestly, I haven't seen this much sadness and bitter-sweet childhood goodbying since the shutdowns of Club Penguin and Miiverse, respectively. And I wasn't part of either of those, unlike this.